to the honey & cinnamon flavors, and it's so easy! spray an 9x13 baking dish with nonstick spray & preheat oven to 350 degrees. 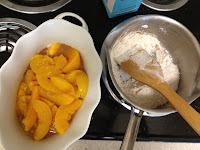 in a mixing bowl, toss together the peaches, honey, cornstarch, cinnamon, & salt until combined. taste test, and sprinkle in additional sugar if needed. pour the filling into the baking dish. in a smaller bowl, stir together the flour, sugar, baking powder, salt, and cinnamon. cut in the butter chunks, so that dough is crumbly. add the boiling water, and stir until it forms a dough. drop small chunks of the dough on top of the peach filling mixture. bake for 40 minutes or until golden brown and bubbly. cool before serving. and for goodness sake, serve with ice cream!!! Are You Sure That Car Is Yours?? ?